If five players can't stop Kelsey Griffin, what chance do just three have? The WNBL's most valuable player will join Canberra Capitals teammate Keely Froling and ACT export Carlie Smith at a Basketball Australia three-on-three national camp on March 28-29. Griffin claimed the league MVP, Capitals MVP, and grand final MVP awards in what was arguably the best individual season of her career. The 31-year-old and Froling played key roles in Canberra's drought-breaking WNBL title last season and both will be back for the Capitals' championship defence in 2019-20. But first on the agenda is the chance to press their claims as the best three-on-three players in the country with an eye on the World Cup and an Olympic Games appeararance in 2020. The national camp and the upcoming Pro Hustle series will dictate selections for the World Cup and could have a major bearing on the Tokyo Games next year, with three-on-three basketball set to feature for the first time. BA has selected 11 women and 11 men to join the camp in Melbourne which will have a major bearing on selections for May's three-on-three World Cup qualifier in Puerto Rico. Success in the qualifiers would land the Australian sides a spot in the World Cup in Amsterdam from June 18-23. "There’s a real spark of interest in [three-on-three] among our national league players," Austra.ian head coach David Biwer said. 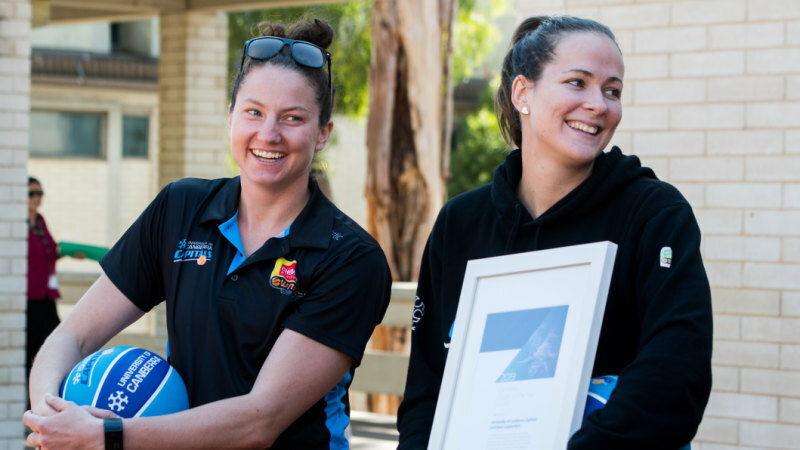 "WNBL athletes, in particular, have shown great support and awareness that now is the time to get involved to gain experience and ranking points ahead of some major upcoming tournaments. "There are some nice inclusions with Kelsey Griffin showing interest and Sara Blicavs returning as well. A lot of WNBL stars have shown love to [three-on-three] which has been good. "If the athletes that get selected for the World Cup qualifier play well, the opportunity is certainly there to compete at Olympics and Commonwealth Games in the coming years." Three-on-three selection adds another element to a whirlwind year that has taken Griffin into a new WNBL club, Commonwealth Games gold, and a return to the WNBA. Griffin has joined the Minnesota Lynx on a training camp contract and she will join the team in May, and an extension could rule her out of Australia's three-on-three World Cup bid. An ankle injury halted Griffin's hopes of a WNBA return last year but she says "now with my understanding of body management and what I can do on the court, I will probably be the most prepared I have been for a WNBA season I have in my career". Australian three-on-three squad: Women – Kelsey Griffin, Keely Froling, Carlie Smith, Sara Blicavs, Izzy Chilcott, Bec Cole, Anneli Maley, Izzy Miotti, Amelia Todhunter, Marena WHittle, Hanna Zavecz. Men – Lucas Barker, Tim Coenraad, Peter Crawford, Darcy Harding, Greg Hire, Owen Odigie, Joel Spear, Andrew Steel, Felix von Hofe, Lucas Walker, Tom Wright.